Got a planet up to 81 population today. Used colonizers to keep dropping people off. Over 100 raw production. Over 500 research a turn. The planets I was pulling the people from had hospitals so they were able to keep up. Was fun so I thought I would share. I discovered that if you overpopulate synthetic worlds, you get 2 added bonuses. 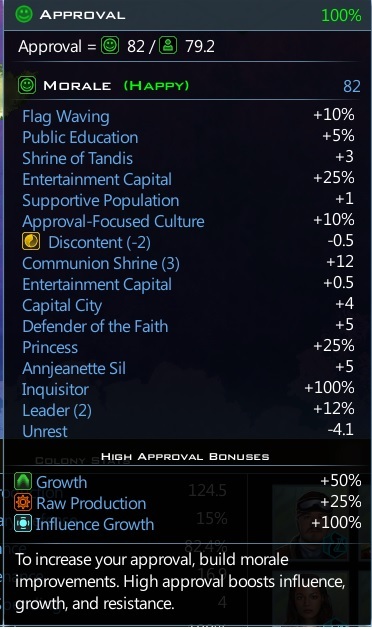 Synthetic worlds' populations don't decay and you don't have to worry about morale. I guess that perhaps the old cap of 100 population for these two things kicks in. Yes, the 100 pop cap for Synthetic is in the .xml files. So I guess it is working as intended. Here is the picture Frogboy. Approval is the limiting factor on pop size. Merc ships help a lot. Inspired by what you found out I wanted to know how far I could push a planet's output using your method and if it's viable for the higher difficulty levels. I focused absolutely everything on the planet (all citizens, asteroid mines, ...) and built 20 fully maxed economic starbases around it. 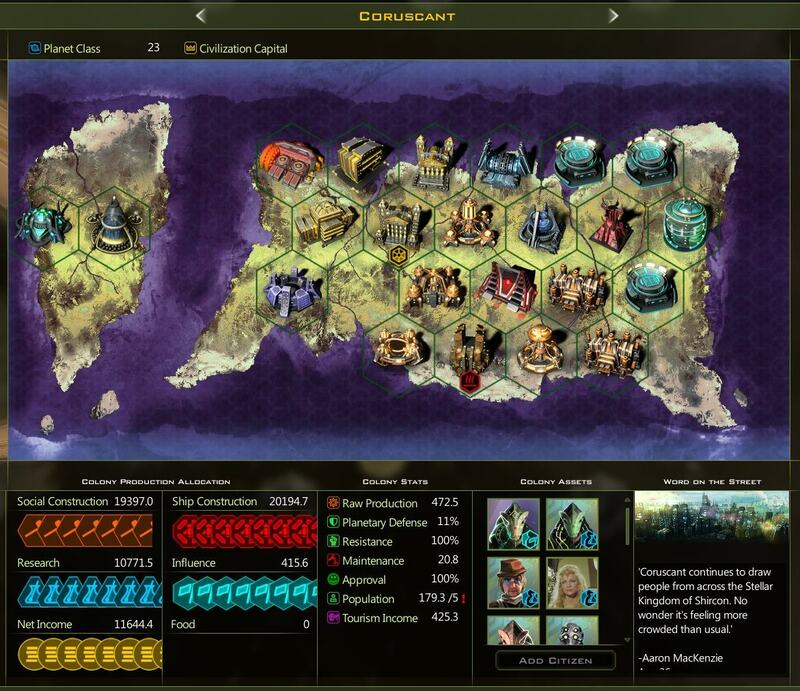 Game was on Genius difficulty, Gigantic spiral galaxy, 15 opponents, Vigilant Engineers as racial traits. Game was pretty easy, overloading the planet makes it scale very nicely with the game's progression. So this is absolutely a competitive strategy for the higher difficulty levels. I'm sure I could have pulled it off on Incredible, dunno about Godlike. Is it cheesy? Absolutely. Is it OP? Probably yes, but mostly because there is no limit here. You can always train another Celebrity which increases the planet's approval and enables you to ship more population to it. This requires a lot of dedication and quite a bit of micromanagement though.